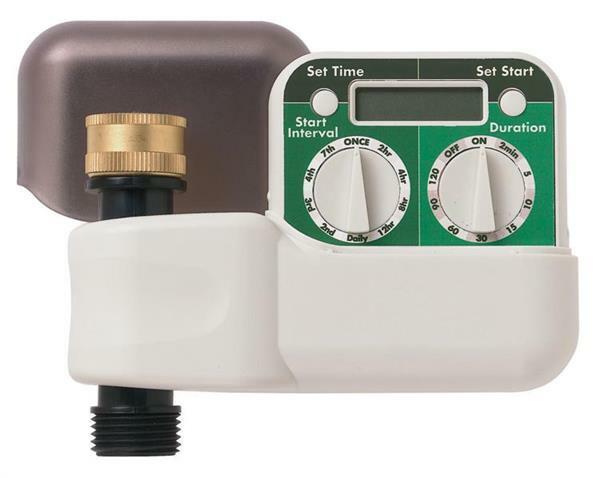 If you’re not a fan of irrigation systems, but still need to maintain a regular watering schedule, hose tap timer units are a great way to go. These digital units are generally battery operated, with batteries lasting a full growing season. Orbit offers a good selection of timers, with different configurations depending on your needs. If your watering needs require specific timing and duration, Orbit’s two-dial digital hose faucet timer is the way to go. One dial controls the watering interval, the other dial controls the watering time. The timer has a selection of ten watering intervals, from once a week to once every two hours. The watering duration options range from 2 to 120 minutes. The left button sets the digital timer for the time of day, and the right button sets the digital watering time. 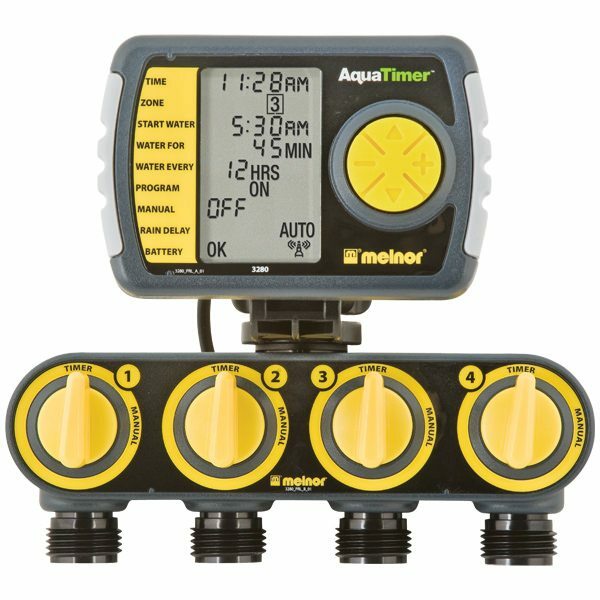 If your watering needs are more complex, perhaps with different watering areas, Melnor offers a digital timer that comes equipped with four ports to accommodate four different watering areas. It features a large LED screen for easy programming and a quick manual on-off switch for immediate needs, without the electronics. To maximize your water resources, connecting to a drip hose instead of a sprinkler can dramatically cut down on wasted water in flower and vegetable beds. These drip hoses lay flat and deliver water slowly to the roots, where plants make the best use of the water. Of course the best way to manage water use in landscaping is to ensure that your plantings match the climate in your area. If your location is prone to drought, you may want to consider less thirsty options for your landscape design.